Dan Schrack is soon available. 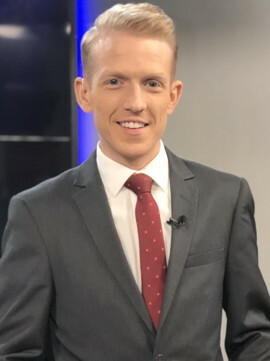 He's now a Morning Anchor/Producer and Reporter in Elmira. In his spare time, Dan is an avid runner and has completed the New York City marathon three times. Contract ends 6/11/2019. Please consider him! See all of Dan's clips. WENY/EENY-TV, Elmira: Morning Show Anchor/Producer (06/17 - present). Duties include researching and developing local and national stories while considering viewer and reader appeal. Stack rundowns, write and edit scripts. Write and produce headlines, opens and teases. Request and supervised the production of graphics. Time newscasts while anchoring show and guiding field crew. Produce and publish content for mobile, web and social media. Create and shoot new content for future broadcasts. Thorough knowledge of ENPS and Adobe Premiere Pro software. Constant interaction with viewers via social media. Team player and multi-tasker. WIVB/WNLO-TV, Buffalo: Morning Show Producer (03/15 - 06/17). Duties included researching and developing local and national stories while considering viewer and reader appeal. Stacked rundowns, wrote and edited scripts in collaboration with talent. Wrote and produced headlines, opens and teases. Requested and supervised the production of graphics. Timed newscasts while guiding talent and field crew. Produced and published content for mobile, web and social media. Thorough knowledge of AVID software including iNEWS and other editing tools. Legends Bar and Grill, Niagara Falls: Food and Beverage Director/Bar and Restaurant Manager (06/13 - 03/15). Duties included management and scheduling of a staff of 45 employees (kitchen, restaurant, bar, and security). Ordered and purchased inventory including, food, beverage, and dry goods. Handled all advertising (print and social media), booked musicians and parties for three venues. Maintained a safe, secure and healthy facility following all rules and regulations set by the Niagara County Department of Health. The Greenwich Hotel, New York City: Front Desk Agent/Concierge (08/11 - 6/13). Duties included assisting guests through the arrival and departure process, conducting over the phone and face-to-face sales and any other guest relations and services. Niagara County Community College, Sanborn, NY: Public Communications. The American Musical and Dramatic Academy, New York/Los Angeles: Acting. Lisa Polster (former supervisor), News Director, WIVB-TV, Buffalo, 716- 462-2758. Teresa Weakley (former co-worker), Morning Anchor, WOOD-TV, Grand Rapids, 269-352- 2950. Carleen Bragg (former co-worker), 11 p.m. Producer, WCNC-TV, Charlotte, 843-452-6976.